Latest arrival January 2016 in Grainpro. There are a few coffees we tend to bring in from Panama each year because each is terrific in its own right and we find it hard to pick just one. One of those coffees is this La Milagrosa (The Miracle), also known as Panacoffee, which is grown by our friend Hector (aka Tito) Vargas, a grower whose coffee has really blossomed during the past decade. Hector calls his farm The Miracle as he recounts the story of how, years ago, his parents saved some money for him to get started in college. Instead of using the money for tuition he bought a barren farm in Boquete with a dream of growing coffee. His parents were very upset and regarded his decision as whimsical and irresponsible. But he has dedicated his career to this ambition and turned the farm into a stunning success which has received much critical acclaim. He has moved from the ranks of little known grower, to a consistent contender in coffee competitions. He has placed among the top group in the Best of Panama each year and 2012 his geisha coffee once again took second place scoring 90.40, just behind the now world famous Hacienda Esmeralda. This lot later sold at auction for over $90.25 per pound! 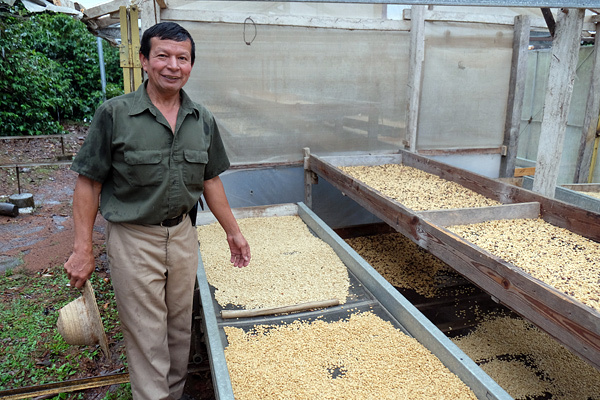 Hector grows Typica, Catuai and Geisha varietals on his farm. This Panacoffee is a blend of two varietals, Typica and Catuai. This year we had the distinct pleasure of visiting Hector's farm and getting an intimate tour of his humble albeit very successful operation. From harvesting to processing, Hector has his hands in literally every part of the production and his great care and attention to detail is obvious in final cup. We first met Hector in 2007. His coffee had placed in 2006 Best of Panama winning group, a coffee called La Milagrosa, and we bought that competition lot. We became jurors of the competition in that year and when we arrived in Boquete Hector made a point of looking us up. He is from a very humble background, a real salt-of-the-earth farmer who does all the manual, back breaking work on his small farm. He was thrilled that his coffee made it into the final auction and equally so that we 'discovered' it and it was being sold in the US. In the years since, Hector, previously obscured by better known and financed farms in Panama, has become something of a rising star. This is a tremendous accomplishment and it has been delightful to have had some small role in this, watching a humble farmer reap the rewards of his labor. And, each year his coffee seems to get better. We are happy to have it available for you once again. Hector Vargas in 2015 seen here on his farm beside his drying tables. Hector Vargas in 2007 when we first met him. Barry left, Bob right. 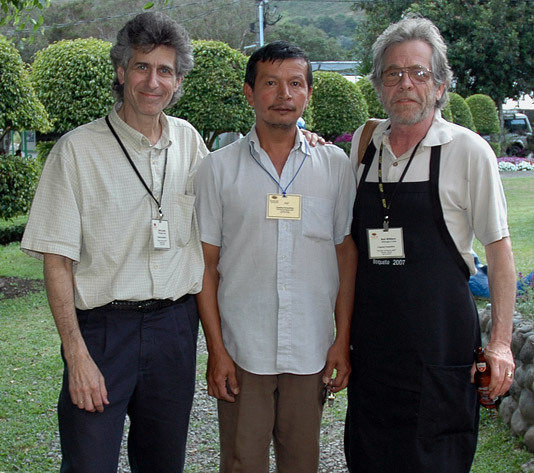 Hector Vargas' farm is in Panama's Jaramillo, Boquete zone, near the Baru Volcano. This particular coffee, Panacoffee, is grown at around 5400 elevation on a site which gets about 170 inches a year of rainfall. It is fully washed and sun-dried. Cup Characteristics: Very bright, elegant and succulent. A clean, balanced coffee with apple-like tartness. Pleasantly sweet with hints of lemon citrus and a long, lingering finish. Roasting Notes: Approach 2nd crack but stop just of short of it and FC to retain sweetness and acidity. C+ will work best with this elegant coffee.